The Sin War is a trilogy that takes place in the “universe” of the Diablo games. All of the books in this series were written by Richard A. Knaak. According to the Diablo Wiki, everything that happens in The Sin War trilogy takes place around 3000 years before the darkening of Tristram. 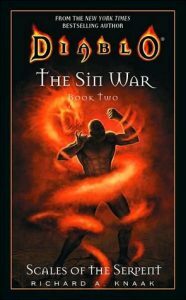 The Sin War: Scales of the Serpent is the second book in the trilogy, and it was published in 2007. This means that when the books were first published, fans had to wait for about a year after The Sin War: Birthright came out to see what happened next. We waited, frequently checking the shelves of our local bookstores, hoping to find the next part of the series. I first heard about this place in the first episode of Skolnick’s Warcraft Less Traveled podcast. The abandoned Tauren Farm is on the southwestern Silithus coast. You pretty much have to swim there. When you can see the windmill, it means you are nearly there. The screenshots you see in this blog were taken on October 5, 2010.